Simple is beautiful, and nowhere is that more true than in the layout of a Jeep. In fact, while you might have heard veteran mechanics complain about how it’s impossible to actually work on modern cars, Jeeps have remained as accessible as anything on the road. DIY projects can be a great way to learn more about your Jeep — and many owners take pride in making their own repairs and upgrades. But while the Jeep’s “easy to wrench on” reputation has helped it maintain its rugged image, you can hurt yourself just as quickly wrenching on a Jeep as any other vehicle. Heck, the fact that you do most of the repairs yourself might even expose you to more danger! I’m not talking about which brand of suspension to buy. Whenever you’re working on your Jeep, it should be supported on jack stands. Many DIY Jeep projects will require you to remove wheels. Even if you have the clearance to get beneath it, working on your Jeep without jacking it up risks having it roll during the job. 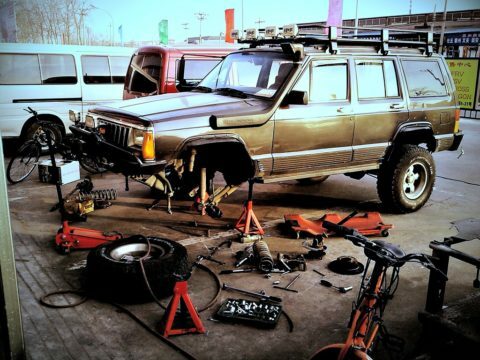 Learn the proper support points to lift your Jeep, and purchase some quality jack stands. Make sure you have the vehicle on all 4 jack stands anytime you’re working on suspension components. More than just about any other vehicle, Jeeps like to get dirty. If you frequently take your Jeep off-road, a good pair of safety glasses is a must. On more than one occasion, I’ve crawled under my rig to fix an exhaust leak or find out what’s making a noise — only to finish the job with more dirt on my face than I had after the last off-road jaunt. Even if you wash your Jeep before tackling a DIY project (which you should… to make it easier to find things), there will still be hidden rocks and dirt clods wedged into places the hose or power washer missed. Having loose dirt or rocks fall in your eye (or worse yet getting an eye full of fuel, oil, or transmission fluid!) is a very painful and very avoidable situation. A garage is the go-to for most weekend wrenches out there. But if you’re working in a cluttered or poorly ventilated environment, you could be putting yourself in harm’s way. You have enough space to work and that you have supplies ready — in case of an oil spill or fuel spill. 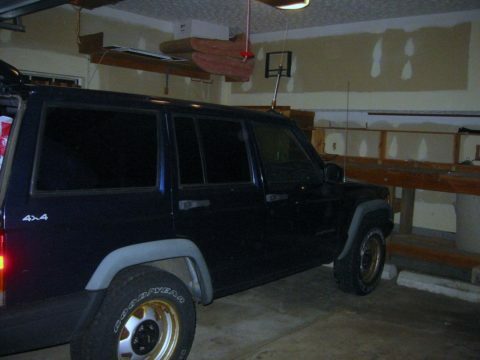 You have the Jeep all the way in the garage. Don’t park it beneath the path of your garage door. Your garage door is functional and raises when you operate it — in case you need to quickly vent fumes from your workspace. It’s a good idea to test your garage door monthly to make sure it’s in proper working order. I have a not-so-fond memory of my garage door falling with a thud. I was thankful that I (or my car) wasn’t under it! Remember when you were first learning to wrench and you completely stripped that hub bolt by using a metric wrench on English hardware? I do! These things are frustrating at the least. But forcing a job can cause you to slip and hurt yourself — or lead to failures on the road or trail. Don’t try it. Batteries are easy to work on — just 2 terminals. Disconnect the black one first, or was it the red one? I don’t like to admit it, but even I forget this simple one at times. If you do, the result can be a polarized wrench and a shower of sparks! That’s never good. Thankfully, in my case, a pair of insulated rubber gloves kept the glowing orange shards from fusing my hand to a box wrench. Gloves are always a good idea — whether it’s for heat protection, to assist with grip, or even just to keep dirt and grime off your hands. Don’t start a job without them. Remember all that dirt I mentioned earlier? If you’re working under the hood of a vehicle that goes offroad frequently (or even one that doesn’t), you’re breathing that and all types of other nasty stuff in. Proper lung protection is important when you’re working with exposed chemicals or heavy dust. Pick up a pack of cheap dust masks and put one on whenever you’re working on your Jeep. It might not be the hottest fashion statement, but you’re into Jeeps — remember? It’s not about keeping up with appearances. All things considered, working on your own Jeep can still make you sound rugged without beating you up. The best days spend in your Jeep are the ones when you don’t have to think about taking parts off — and the abuse that comes with it. Let’s keep that to a minimum together.